Jupiter, one of the largest celestial body int he solar system, will appear its biggest and brightest on 3rd Dec 2012. The gas giant, which as more number of rings at its closet approach, According to Sri Raghunandan of planetary society of India. it will be visible to the eye's an hour after sunset. It will be appear in eastern direction. It will be visible whole night and lastly can be spotted in southern direction on Tuesday midnight at a higher elevation. According to Mr,. 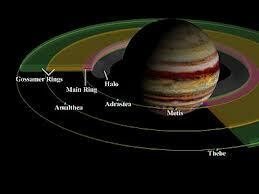 Raghunandan, Jupiter, which have more number of natural satellites, will be in ' opposition ' on night. " A planet is said to be in in opposition when it is directly opposite to sun from our point of view ( from earth ).